The girls recently finished their most difficult hand-sewing project to date – a pair of super-cute and cuddly sock monkeys! We cut, stuffed, and sewed in short sessions over a couple weeks time. 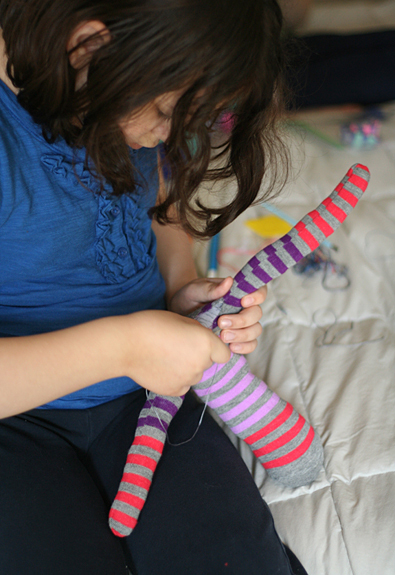 We used the excellent sock monkey tutorial at Craft Passion– I have never sewn anything like this, so I was thankful for detailed instructions with photos. 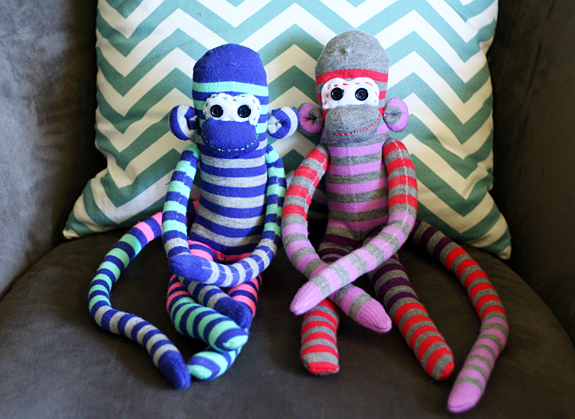 Each sock monkey is made from one pair of socks. Ours were colorful knee-highs found on the clearance rack at Target. If you use knee-highs, like we did, you will need to cut some length from your tail, legs, and arms so they aren’t ridiculously long. We learned some new stitches (my girls can do a ladder or blind stitch now! ), and did some of our own improvising along the way. The hardest parts for the girls were sewing on the eyes and the mouth piece, so I gave extra help with those parts. Also, we did not follow the tutorial for the tail using batting – we just took our time stuffing that long tail with little pieces of batting. Worked fine for us, with the help of the eraser-side of a pencil for gentle pushing. The girls are so proud of their finished sock monkeys, as they should be! Next on their sewing agenda is some time on the sewing machine making a few sets of stuffed animal clothes. We’ll be using the Stuffed Animal Jammies pattern at It’s Always August and the Stuffed Animal Shorts pattern at The Tulip Patch. 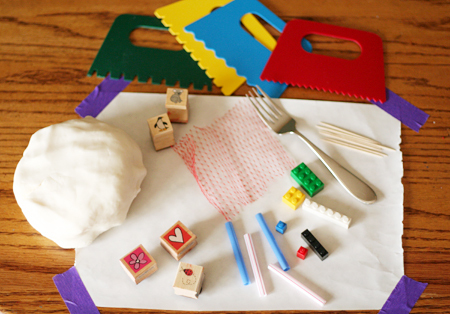 If you sew with or for your kids, I’d love to hear about the projects you’re working on! Good Monday morning! 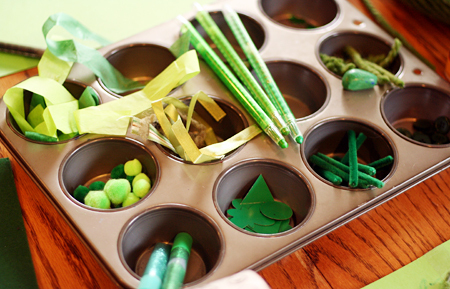 I’m sharing a fun springtime art project at Make and Takes today. My girls and I made a huge pile of easy-to-fold origami tulips, then they made beautiful pastel scenes to go with them. Get the how-to over at Make and Takes. Happy creating! 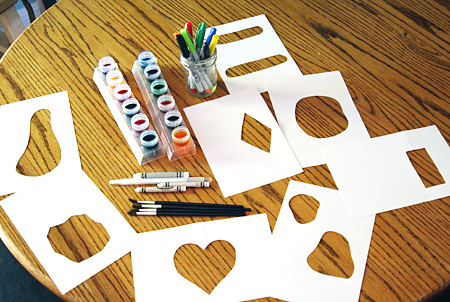 Still have time for a little Valentine crafting? I’m sharing a fun chalk pastel hearts project at Make and Takes this week – if you and your kids have never played with chalk pastels, this is a great beginner project. And, if you’re all hearted-out, try the technique with a different shape! Head over to Make and Takes for the full scoop! Brr! We’ve been having some super chilly days around here. But, the sun is shining, so we bundle-up and head outside anyway. Thank goodness for warm hats, scarves, and mittens! When we’ve had enough cold, we come inside, drink something warm, and settle in with a book, a game, or an art project. Here’s one such project for a winter’s day – design your own silly and symmetrical paper mittens! P.S. Did you see my girls’ adjective self-portraits at Make and Takes last week? I hope you’ll check them out! During a recent science exploration, the girls and I were learning about Cnidaria, the animal group that includes anemones, coral, and sea jellies. After reading a few books, watching some videos, and filling our brains with fascinating facts, an art project was in order! 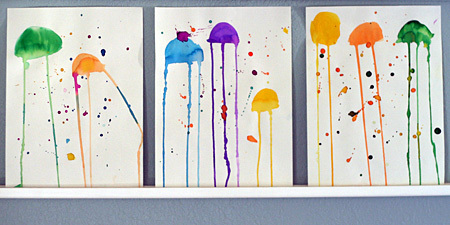 We decided to try a jellyfish painting project found at For the Love of Art. 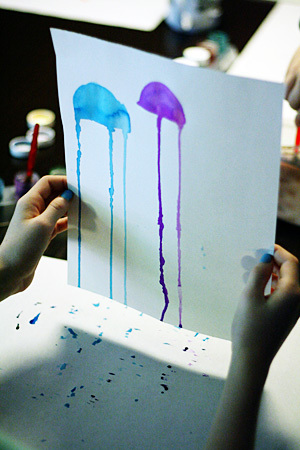 All you need are liquid watercolors or watered-down tempera paint, paper, and brushes to create some color jellyfish. 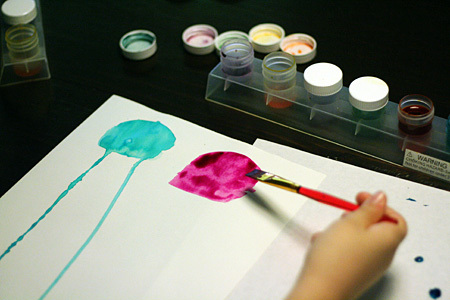 Start by painting a half circle on your paper, using enough paint to make it wet and drippy. Then, dip your brush in water and add more water to the bottom of the half-circle. Now, stand the paper up and give it a few taps on the table to get the paint rolling down. Be sure you have a piece of newspaper or scratch paper on the table to catch your drips. Continue adding jellyfish one at a time to your painting. Finish off your painting with some colorful splatters – I recommend having a good amount of scratch paper underneath while you splatter! 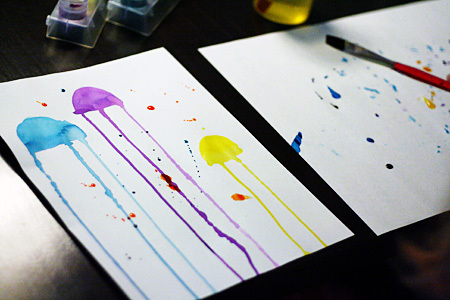 We had such fun making these colorful jellyfish that we ended up with a huge pile of paintings. The girls have continued to experiment with this dripping technique in other paintings, too – it’s a fun process! My girls love making ornaments, especially when glitter is involved! 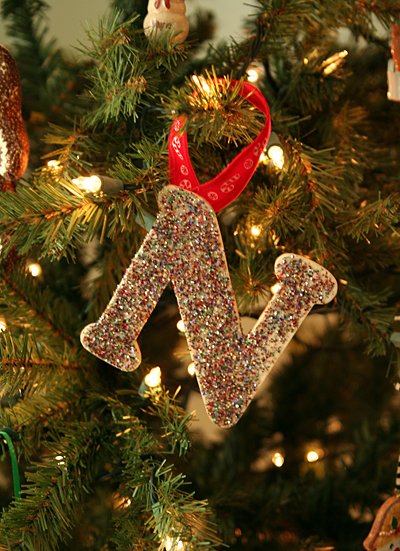 We enjoyed making these super-simple glittery initial ornaments for ourselves, and to tie on packages for friends and cousins. 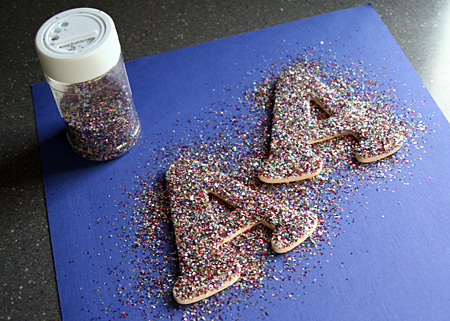 Before adding the glitter, paint your letters if you like – we just left ours plain wood. 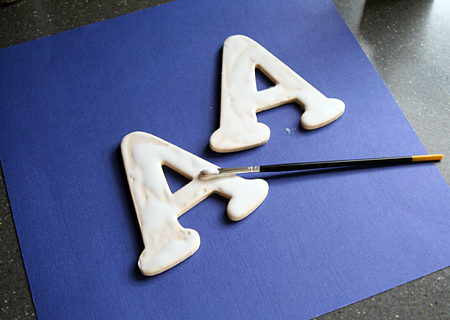 Cover the letters with a generous amount of glue. 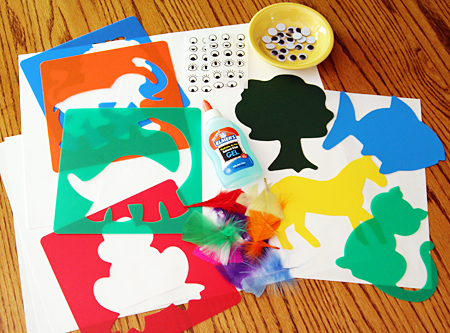 We squeezed on the glue, then spread it all around with a paintbrush. Here comes the fun part – shake or sprinkle on lots and lots of glitter. Make sure the whole surface is covered! Let dry thoroughly, then shake off the extra glitter. Hot glue a ribbon on the back for hanging, and add this beautiful ornament to your tree or gift. We love a little sparkle on our Christmas tree! I’m sharing an art project at Make and Takes today, one that will help you brighten the dark evenings of late fall and winter. My girls are all about candlelight dinners right now – so fun! Head over to Make and Takes for the scoop on making some tracing paper votive covers – see you there! Happy Monday! I hope fall is treating you well, so far. The weather change has been encouraging us to sit outside with warm drinks, pull out our soup recipes, and try to capture the autumn colors with our cameras. I love fall! 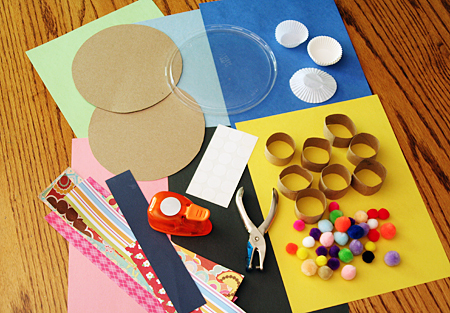 I’ve shared two simple and fun fall crafts at Make and Takes this month, perfect for afternoon crafting with your kiddos. 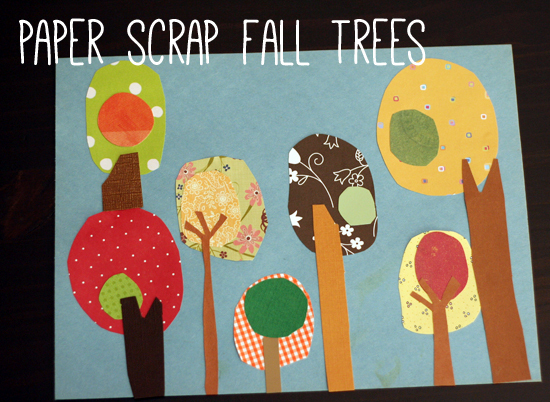 Go for a leaf gathering walk, then create beautiful crayon resist leaf rubbings. Or, follow-up a trip to the pumpkin patch with collage-style paper patchwork pumpkins. How is your family embracing fall?